Less than 10 miles from Lake Barkley and home of Lake Barkley State Resort Park and on the eastern side of Land Between the Lakes (LBL) lies, Cadiz, Kentucky, county seat of Trigg County. With its location at the entrance to LBL, a 170,000 acre outdoor recreation area, Cadiz offers its residents and visitors a blend of city life and a rural outdoor atmosphere. Cadiz, Kentucky offers you, as an industrial prospect, your very own place in the country…a retreat from the big costs of big cities, an ample labor supply, and a happier and healthier environment for executives and workers. Conveniently located in the heart of Southwestern Kentucky, Cadiz is in easy driving via Interstate 24 to this nation’s new major growth area, the mid-south. 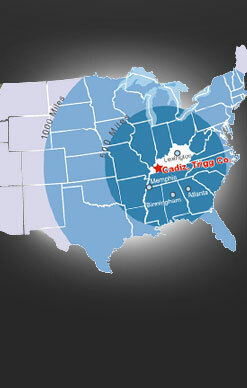 Cadiz’s location is within 70% of US Markets which means expedient delivery time. 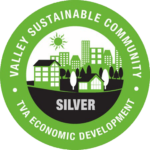 Less than one hour from Nashville, Tennessee and are part of a Metropolitan Statistical Area (MSA). Having a country location like ours doesn’t mean you’re away from everything…its quite the contrary. It means the best of both worlds! Affordable plant sites with all infrastructure in place, a healthy labor climate and ample labor supply, plus an ideal distribution location, all combine to make Cadiz-Trigg County an excellent choice for your new plant location. Please feel free to contact us with any questions you may have in regards to your project. We will be happy to coordinate site visits and be a liaison between government agencies and businesses. We are here to assist you throughout the life of your project. Thank you for visiting our site and considering Cadiz-Trigg County as The Place To Be for your business investment!